Lew Soloff Tribute "Shiny!" with All-Star Lineup by Composer/Arranger Lisa Maxwell - Record Release and Event! It's that time of year again, as jazz journalists, DJs, critics, and bloggers are publishing their annual "Best Of" lists. And once again, for the tenth consecutive year, St. Louis Jazz Notes eschews the compilation of such a list, instead offering a meta-list with links to all of the other "Best Jazz of 2016" lists we can locate. * AJazzNoise.com - The Best Jazz & Noise of 2016…? * JazzBuffalo.org - Announcing The 2016 JazzBuffalo Poll Winners! * Fred Kaplan, Slate/Stereophile - The Best Jazz Albums of 2016 plus the best historical releases. * WNPR - The Year in Jazz: Musicians Ponder the Best of the Best; Who Created the Best Jazz of 2016? Active scouting for more lists will continue for at least a couple more weeks, but your input is welcome, too. 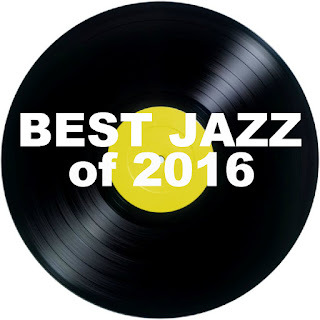 If you've seen any other 2016 year-end jazz lists that aren't mentioned here, please use the comments (or send me an email) to share the information. And if you like, please feel free also to use the comments to discuss your own favorite jazz releases, shows and moments of 2016. Finally, if you want to re-visit StLJN's past "best of" list round-ups, here are the meta-lists for 2007 (parts 1 and 2), 2008 (parts 1 and 2), 2009, 2010, 2011, 2012, 2013, 2014, and 2015. Updated 12/30/16 with five more lists. Updated 12/31/16 with five more lists. Updated 1/1/17 with eleven more lists. Updated 1/2/17 with six more lists. Updated 1/3/17 with four more lists. Updated 1/4/17 with four more lists. Updated 1/5/17 with two more lists. Updated 1/6/17 with four more lists. Updated 1/7/17 with one more list. Updated 1/8/17 with one more list. Updated 1/9/17 with two more lists. Updated 1/10/17 with one more list. Updated 1/14/17 with two more lists. Updated 1/17/17 with one more list. You've never posted the JAZZ JOURNAL MAGAZINE and JAZZWISE Individual top 10 CRITICS POLLS that have been published since 2009. It's nice that you have all in one place most of the available on-line end-of-year polls, but the Jazz Journal and Jazz Wise polls are not readily available unless you pay expensive amounts for there subscriptions and are very much needed. Also for whatever it's worth the JAZZIZ polls have never appeared on your "Best Of" lists.